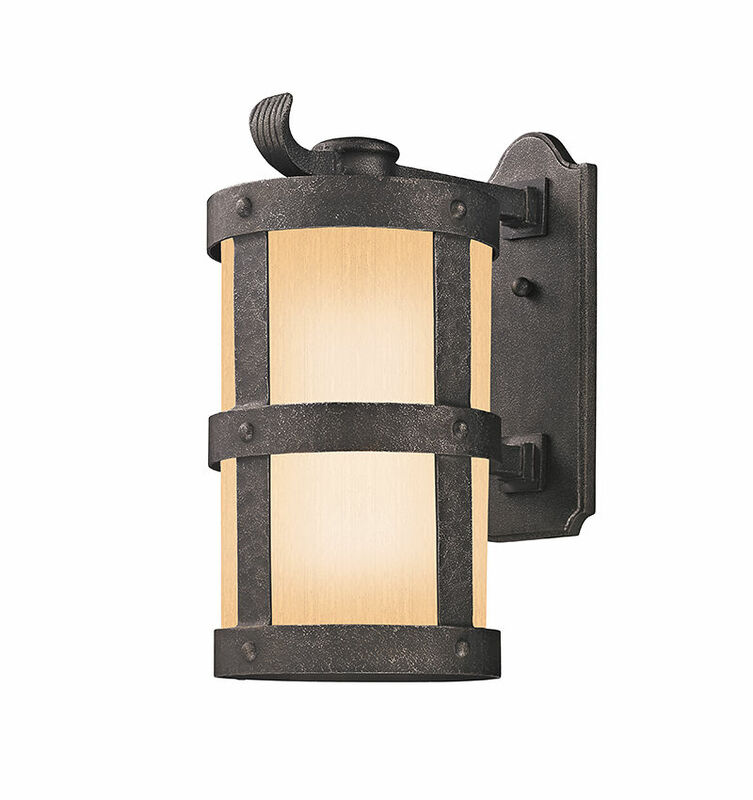 The BF3313 1Lt Wall Lantern Fluorescent is manufactured by Troy Lighting, belongs to the Barbosa Collection and comes with the Barbosa Bronze finish and is made of hand-worked iron. The BF3313 is made in the USA. Measuring 10.25w x 19.5h x 14.25e inches. The B3311 1Lt Wall Lantern is manufactured by Troy Lighting, belongs to the Barbosa Collection and comes with the Barbosa Bronze finish and is made of hand-worked iron. The B3311 is imported. Measuring 5.125w x 9.5h x 7.25e inches. The B3312 3Lt Wall Lantern is manufactured by Troy Lighting, belongs to the Barbosa Collection and comes with the Barbosa Bronze finish and is made of hand-worked iron. The B3312 is imported. Measuring 8.125w x 15h x 10.875e inches. The B3313 4Lt Wall Lantern is manufactured by Troy Lighting, belongs to the Barbosa Collection and comes with the Barbosa Bronze finish and is made of hand-worked iron. The B3313 is imported. Measuring 10.25w x 19.5h x 14.25e inches. The B3315 3Lt Wall Lantern Extended is manufactured by Troy Lighting, belongs to the Barbosa Collection and comes with the Barbosa Bronze finish and is made of hand-worked iron. The B3315 is imported. Measuring 8.125w x 15h x 22.125e inches. The BF3311 1Lt Wall Lantern is manufactured by Troy Lighting, belongs to the Barbosa Collection and comes with the Barbosa Bronze finish and is made of hand-worked iron. The BF3311 is made in the USA. Measuring 5.125w x 9.5h x 7.25e inches. The BF3312 1Lt Wall Lantern is manufactured by Troy Lighting, belongs to the Barbosa Collection and comes with the Barbosa Bronze finish and is made of hand-worked iron. The BF3312 is made in the USA. Measuring 8.125w x 15h x 10.875e inches. The C3310 2Lt Ceiling Flush is manufactured by Troy Lighting, belongs to the Barbosa Collection and comes with the Barbosa Bronze finish and is made of hand-worked iron. The C3310 is imported. Measuring 7.625h x diameter: 15 inches. The CF3310 2Lt Ceiling Flush is manufactured by Troy Lighting, belongs to the Barbosa Collection and comes with the Barbosa Bronze finish and is made of hand-worked iron. The CF3310 is made in the USA. Measuring 7.75h x diameter: 15 inches. The F3317 3Lt Hanger is manufactured by Troy Lighting, belongs to the Barbosa Collection and comes with the Barbosa Bronze finish and is made of hand-worked iron. The F3317 is imported. Measuring 16.75h x diameter: 8.125 inches. The FF3317 1Lt Hanger is manufactured by Troy Lighting, belongs to the Barbosa Collection and comes with the Barbosa Bronze finish and is made of hand-worked iron. The FF3317 is made in the USA. Measuring 16.75h x diameter: 8.125 inches. The P3316 3Lt Post Lantern is manufactured by Troy Lighting, belongs to the Barbosa Collection and comes with the Barbosa Bronze finish and is made of hand-worked iron. The P3316 is imported. Measuring 19.125h x diameter: 8.125 inches. The PF3316 1Lt Post Lantern is manufactured by Troy Lighting, belongs to the Barbosa Collection and comes with the Barbosa Bronze finish and is made of hand-worked iron. The PF3316 is made in the USA. Measuring 19.125h x diameter: 8.125 inches.